Today is a wonderful day - the sun is shining and the skies are wonderfully blue against the white snow. We are going to spend it in town to do some shopping, and going to see a movie. 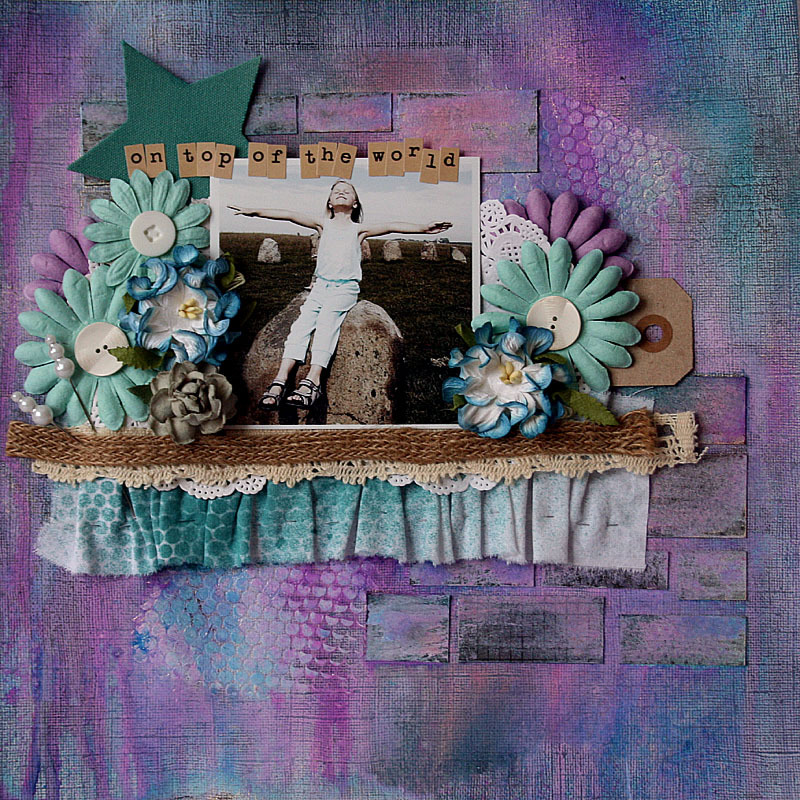 Here's a layout I made for a challenge at En Liten Butik. The challenge is based on a bingo grid, where you get to choose one column and use the tings in it on your layout. The column I chose had Glimmer Mist, pins, fabric, and a star. The background is a navy blue cardstock, which I primed with gesso. 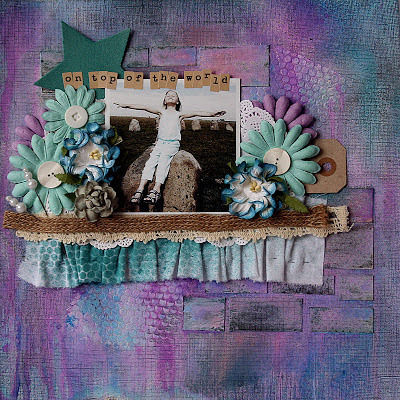 Then I used some punchinella and multi-medium to create some texture, and then I cut out some square pieces of a thicker cardstock, stamped a bit on them, and glued them onto the background. Then I misted the paper with Dylusions mists in blue, purple and orange, plus some Glimmer Mist in Iridesent Gold, which I put on to make the Dylusions mists blend and run a little bit. It also made them more transparent. I could have used water for that, but I wanted the background to glimmer a bit. The photo is from one of our favourite places in the world, Kåseberga in Skåne. We went there last summer, the kids and I while P was working (as usual), and lucky for us, the weather that day turned out to be perfect for paragliding. So we had our picknick surrounded by these paragliders, and the kids thought they were so cool. Later, Agnes climbed up on top of one of the big rocks of the stone ship, and I got this lovely photo of her. She had been a bit grumpy getting up there, because the paths are very steep, but when we finally got up, she loved it, and having an ice cream in the little fishing village below the hill made her grumpiness go away completely. Men jösses vilken snygg LO du gjort, jag tokgillar verkligen ditt val av färger och utmaningen har du lyckats med galant. Tusen tack för ditt bidrag och lycka till i tävlingen!